This digital recorder can record audio / video in high definition with a maximum resolution of 1260 x 960 pixels up to 25 frames / second AVI format standard recognized by all media players. 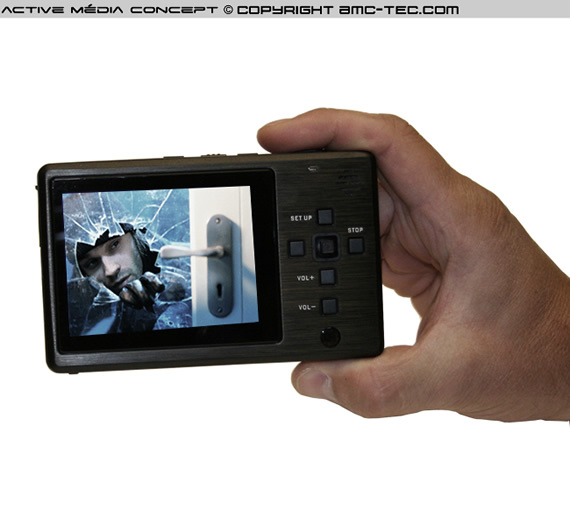 - 1) A motion detection, the recorder is only triggered if there is activity on the images that analysis. The monitored area is divided into 16 parties.Vous can enable / disable each of these 16 zones. 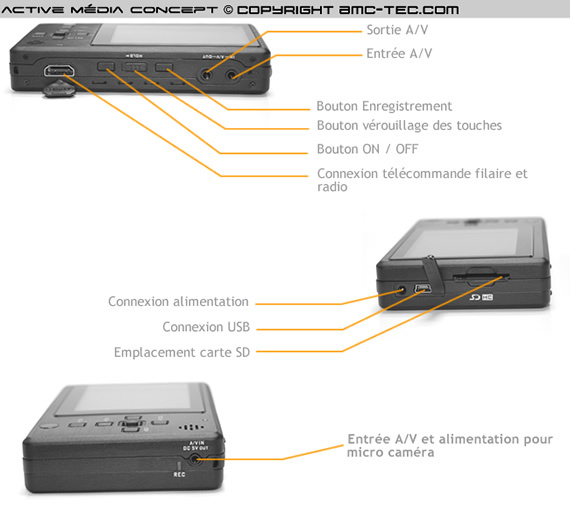 - 2) Manually, directly with the buttons on the unit or if you have chosen the "remote", with the keys of it. - 3) In scheduling: 01/01/2008 from 12:00 to 14:00 for example. Its main advantage comes from its trigger motion detection, that is to say that analyzes the images and will only record when there is activity on this image. This feature allows you to save memory. In addition, it will make it easier when searching because you will be sequences triggered by the detection. An overlay of the date and time of each recorded image indelibly will help you in your search for your records and forensic applications. 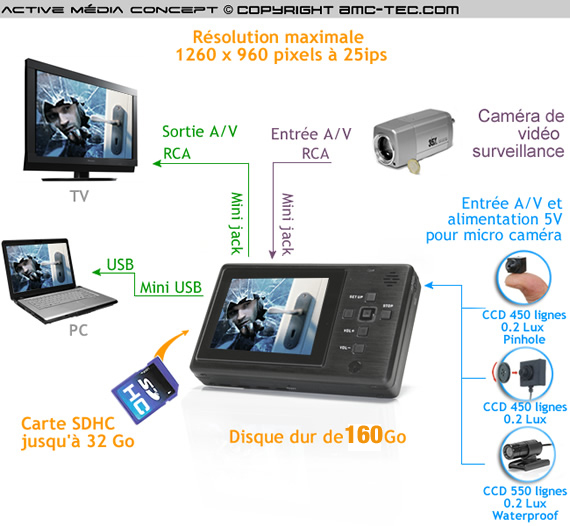 - Either directly on its color screen TFT-LCD 3.5''(320 x 240) Backlit high contrast with good visual quality (during and after registration). A menu with thumbnails will help in this case to the replay of video recordings. You can also lock the full access to the recorder, LCD interface and USB port for retrieving records audio / video. A password will be required to unlock the device. - 5:20 p.m. video format 1280 x 960 px at 25 fps in high quality 5Mbps. 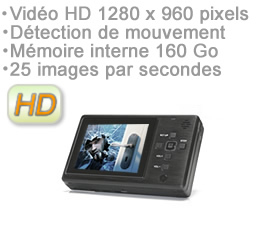 - 25H40 video format 720x576 px at 25 fps in high quality 5Mbps. - 263 Hours of Video format 640x480 px at 15 fps 3.3Mbps as normal. - 5260 Hours of video at 352x288 px with a second image 2.5Mbps in low quality. Its integrated lithium battery will allow you to power a camera and make a continuous recording of approximately 3 hours. An extension of 15.6 A lithium battery available as an option will allow you the same configuration in a backup time of around 2:30 p.m. in continuous recording. - 1) Our DVR-1000 delivers direct power supply for most of our hidden cameras (type button, hidden camera tie, paw, etc ...) directly on the audio / video cord jack 2.5 mm (see the cameras following optional). 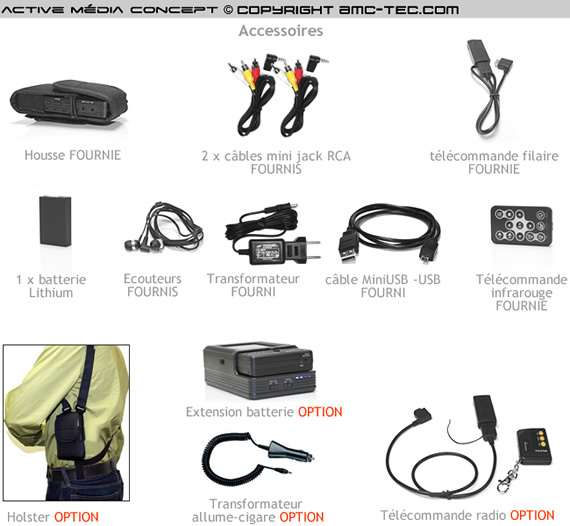 Which eliminates the contribution of a battery for the camera and facilitates connections, there will be a single wire. - 2) You also have a second input audio / video 3.5 mm jack for connecting other types of cameras (with RCA plugs), these must be supplied separately. - 3) Third possibility to connect on the remote control optional. You can thanks to her, a camera feed 12 volts and delete the same time complicated connections while controlling your remote DVR 1000. - In WIRED: A hose connected to the recorder with a small box-end receiver with three toggle buttons for the following functions: ON, OFF (stop of the camera) and REC for recording. For information on this case, you have a video / audio input that can also power a camera 12 Volts. It will only be for a short-term use because of the limited autonomy of the assembly thus mounted (RCA patch cable that came with the option). - In WIRELESS: A remote control containing the same functionality, ON, OFF and REC. The scope of it is around a hundred feet. - An extension of 15.6 to lithium to increase the backup time to 2:30 p.m. in continuous recording. - A radio command to activate / deactivate the remote recording. - Support DVR-1000 receiver on tripod with 1.2 / 2.4 Ghz integrated. - Car adapter 12/24 volts. - Hidden camera type or paw fed directly from the recorder.